November « 2009 « R-V There Yet? 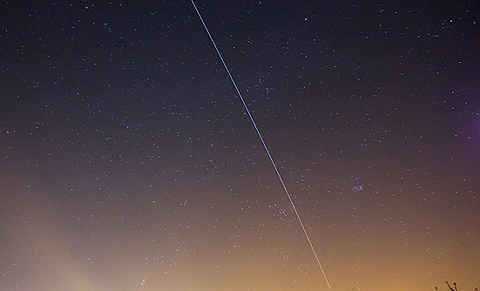 Last night we were treated to a fly-over by the International Space Station,(ISS). This event happens quite often, but this one was unique in that it flew directly overhead and was visible for about 5 minutes. As soon as we went outside, we had no doubt which dot in the sky was the ISS. It appears as the brightest star and moving quickly across the sky. The time to view the station is just before dawn or just after sunset. Last night it showed up at 6:26 PM, a time more to my liking than the pre-dawn visits. The data for the our area is shown below. When there is a space shuttle in space, that information will also be shown. This recipe is courtesy of sister-in-law Lynn. 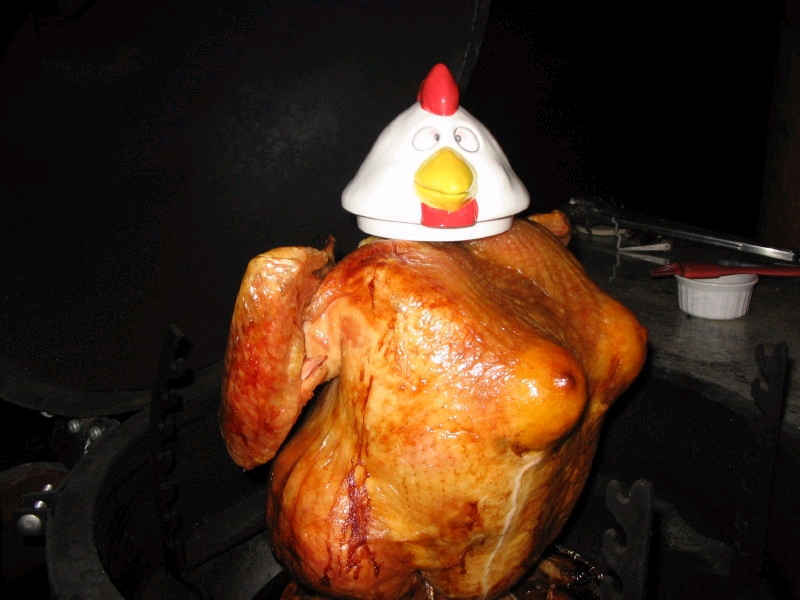 > Rub butter or oil over the skin of the turkey until it is completely coated. Cover and bake for 30-45 minutes. Remove cover and continue to roast until juices run clear, basting every 15-20 minutes. If you’ve followed these steps correctly, your turkey should look like the one in the picture below. Highway, US 83, runs north and south from North Dakota’s border with Canada, where it connects with the Manitoba Hwy 83, and winds itself south to Laredo, Texas and then follows the Rio Grande River to the coast at Brownsville. Down here in the Texas Rio Grande Valley area, it is the major route along the Mexican border. 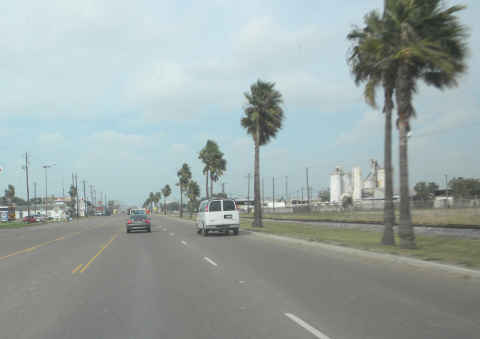 From Mission, just west of McAllen, to Harlingen, there is an expressway that bypasses most of the small towns. Business 83 is a little more interesting. The small border towns along US 83 are all a little different but they generally have one thing in common, low income. Median annual household incomes range from about $15,000 to $25,000. Nearly half are below the poverty level. 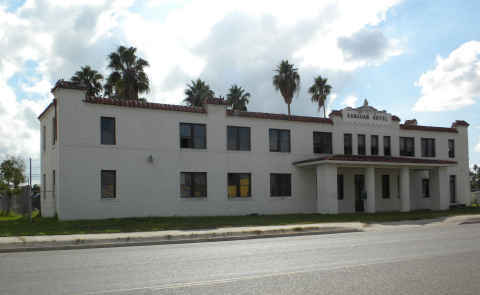 San Juan, Texas is a town just east of McAllen along Bus. US 83. They are at the high end of the small town incomes with a median household income of $22.700. It appears that most commerce in the area is related to the process of citrus and produce. Palm trees line Bus 83 between the road and the railroad. I’m sure that the San Juan Hotel was once a marvelous place to stay, but it is now an unused historical site. Maybe the mice enjoy it. 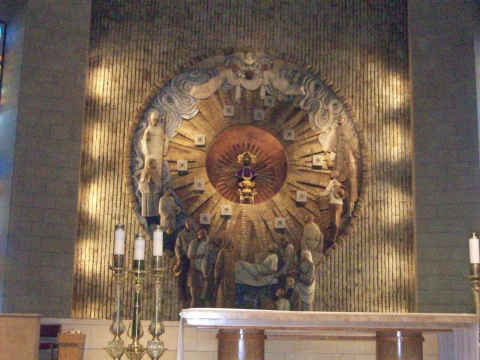 At the other end of the spectrum, San Juan is home to the largest church in the RGV, the Basilica Our Lady of San Juan del Valle. If you’re not in a hurry, our recommendation would be to take the scenic route down business US 83. Many areas remind us of Rt. 66. 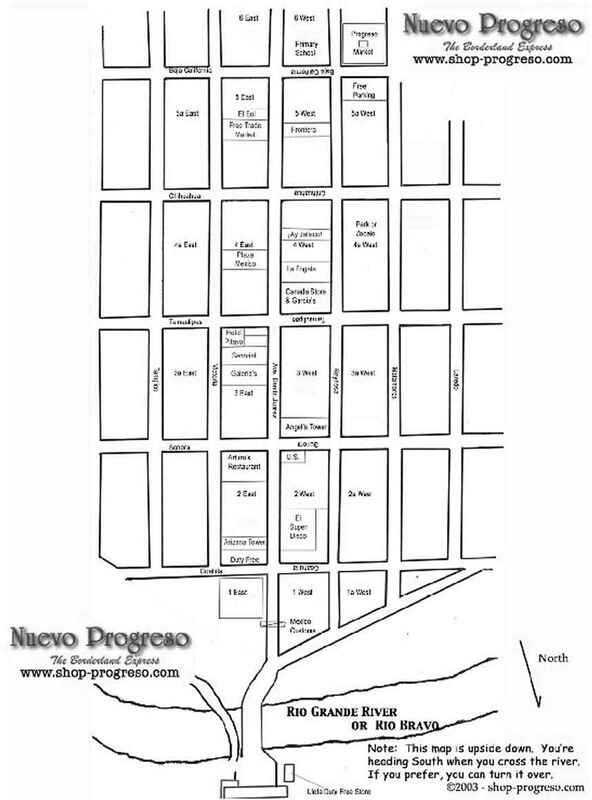 Just across the border from Progreso, Mexico is the town of Progreso, Texas, a town of about 5000 people. 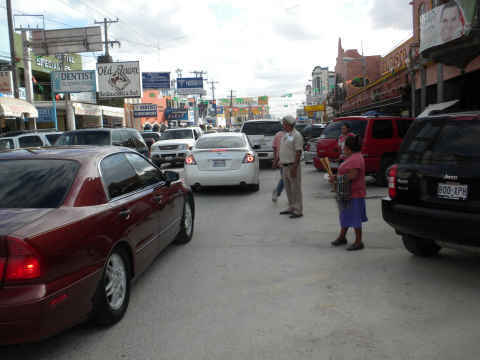 Progreso, TX is an easy border crossing into Mexico and also a well known speed trap. Every day the run down police station is transformed into a court house from 4:00 PM until around 6:00 PM. I mention this because I had the pleasure to pay them a visit this week. 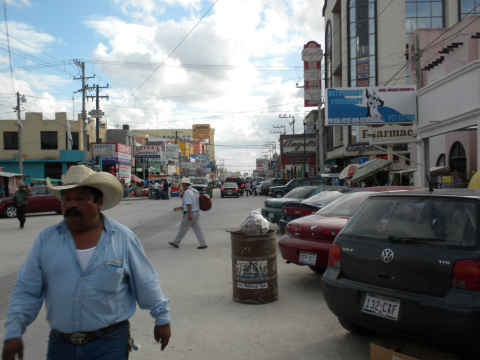 Usually we don’t stay in Mexico after dark, but this time we left at about 6:00 PM for our 20 mile journey home. About a mile north of the border I was pulled over by officer Beinal, badge # 304, for a malfunctioning left head light. I have never heard of people getting anything other than a warning ticket first for this offense. Not in Progreso. I was issued a citation for the headlight and given a time to show up at court. We were driving our jeep which is used for beach activities and trips to Mexico. We rarely drive it a night. Last month we had it inspected and all was well. I purchased a new headlight for about $20 and replaced the old one. Upon inspection the bulb had what appeared to be a BB hole in it. At 2:00 PM yesterday, I gathered my receipt and citation and headed off to the police department where I was told that the judge didn’t arrive until 4:30. I returned then to find that 12 people had signed in ahead of me to see the judge. I suppose that I could have paid a fine, but that would leave me with a moving violation. When my time arrived to see Judge Bustamonte (5:45 PM), he asked if I was guilty and the answer could only be positive since the light was actually out. I showed him my receipt for the light and he dismissed the moving violation. Here’s the catch, I still owed them for court costs of $100.00. I had to go get a money order and return to pay the fee. Judging from the number of people there, it is obvious that this activity is probably the town’s best “fund raiser”. If you happen to be going through Progreso, TX make sure that you don’t speed and that your vehicle is in good working order. Well, we can’t believe it. 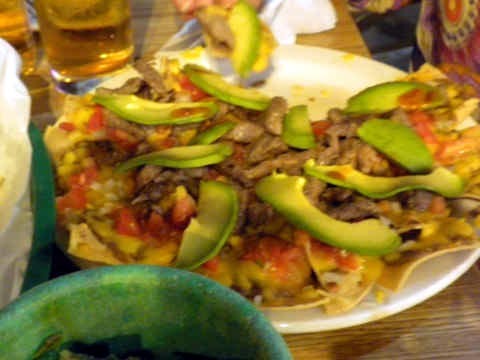 Having spent a lot of time in Mexico over the past few years, we have come to understand what is meant by Mexican time. The term “mañana” doesn’t always mean tomorrow. Our previous blog entry (Click Here) questioned the logic in beginning a massive sewer project as the busy season approached. You can see by the two photos below that the project is now successfully completed. 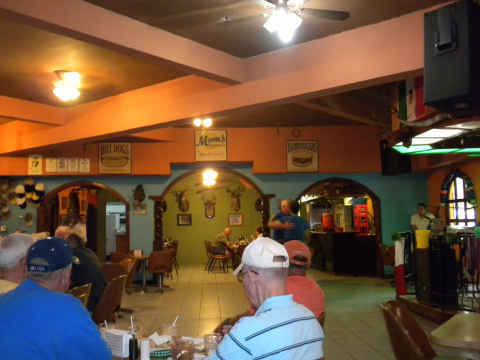 While we were there, we visited a bar named Arriba, which is located about 5 blocks south and a block west of the border crossing, in the Progreso Market. 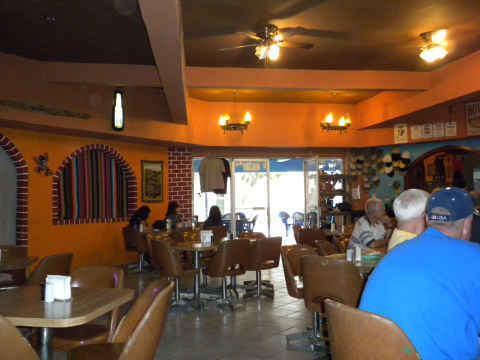 The Arriba bar is very modern, clean and everything is reasonably priced. They also have a nice dance floor. You can see that during the daytime, the clientele consists of mostly Winter Texans. Tinka decided to chow down on nachos. A very good choice. A report on our trip out of Mexico will follow tomorrow. You are currently browsing the R-V There Yet? 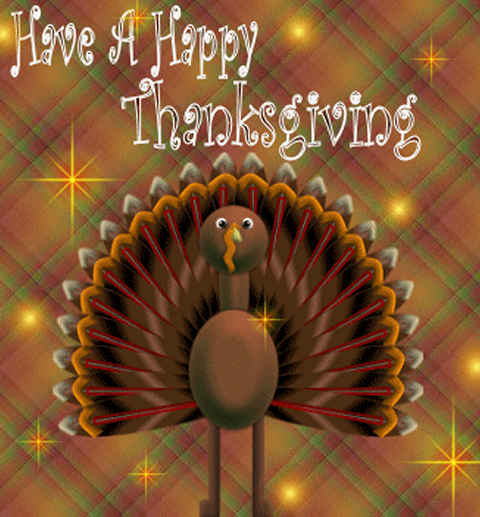 blog archives for November, 2009.